Sheriff Black was murdered during a water dispute in Ferron. At approximately 8:30 a.m., the 48-year-old victim was contacted by a woman who said her brother had assaulted her during an argument over a ditch that crossed their respective properties. The woman and her husband drove to Sheriff Black’s home and asked him to intervene. The couple was followed back to the scene by the unarmed victim driving his own car. As the two vehicles approached the suspect’s farm, he stepped out onto the roadway and stopped them at gunpoint. 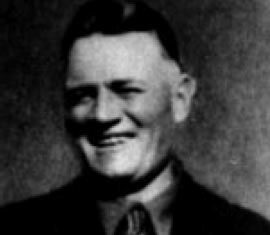 Sheriff Black was immediately shot through head with a .30-40 Krag-Jorgensen rifle. The suspect then shot and killed his brother-in-law. Following the murders, the suspect turned himself into police. He was convicted of second-degree murder, sentenced to life in prison, and paroled seven years later. Sheriff Black was married and the father of six children. He is buried in Ferron City Cemetery. His bronze name plaque is sponsored by the Emery County Sheriff’s Office Deputies Care Fund.